Live Happy, Live Healthy, Live NOW® is the motto at the company created in 1968. They are an industry leader for healthy foods and natural supplements. Their prices are competitive, and their products are excellent. In 2003, they won the Manufacturer of the Year Award. Products are natural and organic. They are based in Chicago, Illinois, USA, providing high-quality personal care products and essential oils to health-conscious consumers. NOW Foods | Our Story video. The testing that NOW® does separates them from others. For the natural products trade, they own and operate the most progressive and forward-thinking private laboratories that is cutting-edge. Their mission is to provide pure and quality products lower than the competition by at least 25 percent. NOW® offers 100% pure therapeutic grade essential oils with their methods for growing plant species, harvesting, and distillation. The citrus fruit essential oils are cold pressed and other companies steam distill citrus. They do not grade A, B, or C for their oils because they are all pure for superiority. USDA Organic plants are always used for all of their oils that are GC/MS (Gas Chromatography Mass Spectrometry) tested scrutinizing the molecules in each oil for customer satisfaction. No pesticides or chemical fertilizers are used. The many tests are done in-house and if you are interested in all of them, please read the NOW® link. You can select from essential oils of scent—camphoraceous, floral, mint, musky, spicy, sweet, and woodsy in glass amber colored bottles. Essential oils are used by lovers of aromatherapy in their homes, offices, hotel, and bank lobbies, and by massage and physical therapists. Use the oils in diffusers or as a massage for wellness as aromatherapists do. For your adventure with your senses, try all of the NOW® oil creations in singles, blends, roll-ons, carrier oils for massage, accessories, and more. My favorite wild flower when walking in the woods in the spring looking for morel mushrooms is finding the blue, pink, or lavender wild geranium (Pelargonium graveolens). The aroma is a soft sweet floral that is purifying, soothing, and stabilizing. The oil is steam distilled from freshly harvested plants and tested for quality and purity packaged in 30 mL (1-ounce) bottles. A nice blend to your ultrasonic diffuser that uses water is to put 2 drops each of geranium oil, rose absolute oil, and clary sage oil to enjoy the experience. Blends make it easy for you to enjoy a variety of natural essences. The oils used in these blends have been carefully chosen and precisely mixed by the NOW® expert aromatherapists to provide a scentsational balance of aromas that complement each other, and any mood, perfectly. If you’re down on a cloudy day, try the Cheer Up Buttercup uplifting blend that incorporates Bergamot Oil, Orange Oil, Lime Oil, Grapefruit Oil, and Lemon Oil that has a light herbal citrus fragrance. Your mood will disappear, and you will feel more energized and refreshed. Natural essential oils are highly concentrated and should be used with care. Always read the label. NOW® Solutions essential oil kits make a perfect gift and to introduce friends and loved ones to the mood-enhancing benefits of essential oils. The four kits pictured above are the romantic oils and blends when misting from your diffuser having a candle lit dinner and soft music with the one you love. Seize your romantic moments anywhere anytime with this fantastic fragrance kit. The pink package above, Love at First Scent, comprises 10 mL bottles of Bergamot, Cinnamon Cassia, Rose Absolute, and the NOW® Naturally Loveable Essential Oil Blend combined in one convenient aromatherapy kit that will have you feeling loved anytime, anywhere. The plants used to produce the NOW® certified organic essential oils are grown in soil that is free of pesticides, synthetic fertilizers, and herbicide residues. Each one is guaranteed to be of fine quality, with the plant’s identity confirmed, and certified organic by Quality Assurance International (QAI). Lemongrass (Cymbopogon flexuosus) is one of my favorite teas to add a touch of honey when it’s a chilly or gloomy day. 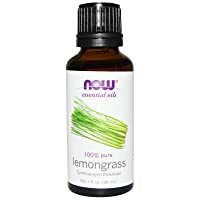 The lemon, grassy, and garden-fresh scent is cleansing, stimulating, and purifying. The only ingredient is the 100% pure organic Lemongrass Oil that is steam distilled from the leaves of the plant. Put 10 drops of Lemongrass, 5 drops of Organic Lemon Oil, and 1 drop of Organic Eucalyptus oil into your ultrasonic type oil diffuser water and jump start your day. To have aromatherapy and therapeutic wellness benefits, NOW® Solutions cool-mist ultrasonic diffusers are a great way to mist your room. Just add water and your favorite 100% essential oils and enjoy. This is one of the elegant ultra-modern diffusers from NOW®. It holds about 4.7-ounces of water and is BPA-free plastic for safe using with your kids. Add 2 to 5 drops of your essential oils for covering about 220-square feet of space operating from 4- to 6-hours. You can expect full benefits from your favorite aroma oil because the technology used does not alter the quality of the oil used by heating it. Enjoy the 6-changing color long-life LED lights for a spellbinding atmosphere in any room. It is quiet and will shut off automatically when the water is low. My endorsement for NOW® is a summing up of what they do and offer. They get high ratings for reasonably priced products. I hope this has been helpful to you. Contact them by phone or email with your questions, concerns, comments, and return policy. I like that their site has a search box to get around easily and quickly. Reveal the secrets of Mother Nature’s plant kingdom for a healthy lifestyle. The ancient cultures understood plants and their benefits as did the new pioneers with the Native Americans who truly understood and respected all plant life. Be well and be happy always!